All views have a navigation bar at the top of the window showing the display parameters. The parameters at the navigation bar are different depending on the views you open, but because all views are linked, changing the location in one view changes the others as well. Camera icon — Click this to capture a selected area in the view (see Taking Screen Captures). IL and CL — The IL and CL boxes show the current location of the inline and crossline. Next to these are their corresponding increments: the amount of movement of each click/scroll when increasing/decreasing the inline and crossline. Vol — Shows the volume options you can select for display. Once you have created groups of volumes (see Creating a Group), these groups will also be listed for selection. If you scroll the mouse wheel at the Vol box with a volume currently selected, the scrolling will stay within the list of volumes. Additionally, if you scroll the mouse wheel at the Vol box with a group currently selected, the scrolling will stay within the list of groups. In the navigation bar, the borders of the IL and CL (or gather dimension, e.g. 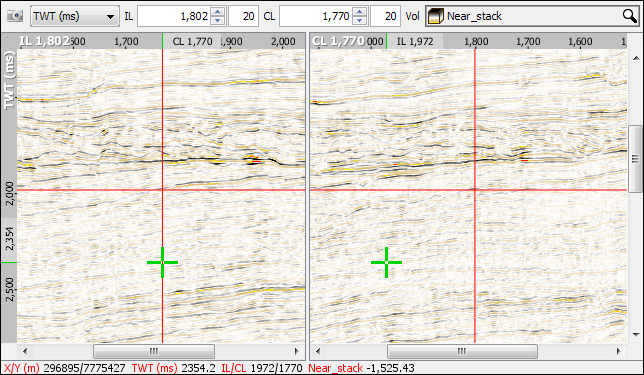 offset) boxes will be dashed if the volume displayed on that slice is interpolated from neighbouring traces (see comparison image above). This is made more obvious by the italicised numbers in the dashed box. Tip: To quickly jump to the nearest uninterpolated location, right-click in the location field, and choose Move to nearest uninterpolated location. press the arrow keys on the keyboard — the up and down keyboard keys will increase/decrease the IL by the accompanying increment, while the right and left keyboard keys will increase/decrease the CL. click the box, type a specific value, and press Enter — for boxes with an increment, the increment will now be based on this value. The red navigation markers in some views show the location of related views. For example, there are two navigation markers on the inline panel, one each for the location of the intersecting crossline panel, and the time/depth slice (Map View). Dragging one of these markers changes the corresponding location. It will snap to a distance that is a multiple of the increment. Double-clicking will move both bars to the clicked location. Navigation markers can be enabled and disabled using the hotkey Ctrl + Shift + S (see Hotkeys). Tip: To move the navigation markers while in picking mode, hold Shift and drag/double click at the desired location. Prev: How do I create a custom coordinate reference system (CRS)?